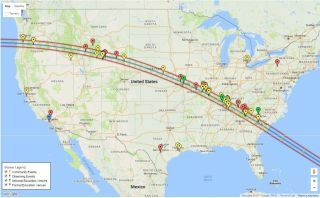 The total solar eclipse of Aug. 21, 2017 (whose path of totality is shown here) will be the subject of multiple presentations at the Northeast Astronomy Forum, held April 8-9 just north of New York City. Scientists and stargazers are gearing up for what's billed as one of the biggest astronomy expos in the world. The Northeast Astronomy Forum (NEAF) will be held April 8 and April 9 at SUNY Rockland Community College in Suffern, just north of New York City, and Space.com will be there to report on all the action. "Each year, we focus on building upon the previous year's conference by continually adding new and exciting things," NEAF co-organizer Ed Siemenn told Space.com via email. Siemenn is also a member of the host organization, the Rockland Astronomy Club. "In addition to live radio broadcasts and interviews with our speakers this year," Siemenn added, "we are expanding the reach of our NEAF Talks by adding live professional streaming on the internet, which will be available worldwide on our YouTube channel." This year, a large emphasis will be placed on the total solar eclipse that will sweep across the continental United States on Aug. 21. This event was previewed at NEAF last year by eclipse expert and retired NASA astrophysicist Fred Espenak; this year, at least two NEAF talks will cover the solar eclipse. One presenter, Michael Reynolds, an astronomy professor at Florida State College, will be "speaking about the science behind an eclipse and the compelling human fascination with them," Siemenn said. Following Reynolds will be a "lighthearted" discussion with Space.com skywatching columnist Joe Rao, whose discussion is called "How to Survive August's Total Eclipse." James Albury and Dean Regas, co-hosts of PBS-TV series "Star Gazers"
Organizers expect the NEAF to attract at least 4,000 attendees this year, Siemenn said. The expo will feature lectures, workshops, planetarium shows, classes, demonstrations and a trade show with more than 100 vendors and exhibitors. For those looking to get involved in the science, there will also be conferences and workshops featuring astronomers from the Lowell Observatory in Arizona and other institutions. To register, go to the NEAF website at http://www.rocklandastronomy.com/neaf.html. This story was originally published on March 31.